Our exclusive World NO.1 PRO-U® LASER TECHNOLOGY^ offers groundbreaking laser hair removal experience and lasting results, achieving more than 300,000 positive reviews from our supporting customers*. 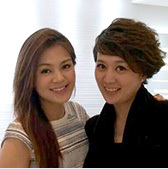 I am so happy that we can help Louisa, a beautiful and intelligent lady, to resolve her hair concerns. It is even more exciting that Louisa gives her first hair removal experience to MediLASE. 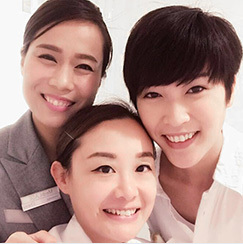 Janice Man once said that she is afraid of pain and cold but she comes here for a session today. She is really really beautiful! Hailey is always busy with her shooting. 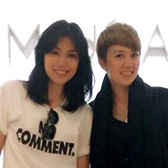 Yet, she comes to our flagship store at The ONE today and is very happy with our efficient treatment session! Sukie comes to the flagship store at The ONE today. (She is really nice and interesting in person.) Thank you for switching to MediLASE. We will do our best! Thank you Yanki for choosing MediLASE. She is not at all ill-tempered in person! Stephy loves our "1+1 Personalized Service", which separates the course of treatment between program consultant and therapist. This allows our specialists to focus on their respective professions to meet her unique hair removal needs. DJ Maria came to our flagship store at The ONE for a workshop with us. Of course she tried our NO.1 Technology as well! Fiona thinks that our technology is really quick and easy, she can even come for a session before her next job! 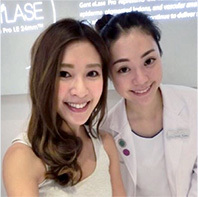 Stylish mom Lillian comes to MediLASE for her first session today, and the result is so satisfactory. Your support drives us better! Nicole has 2 major areas done with MediLASE. 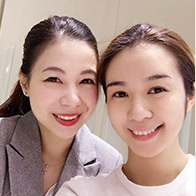 We are so glad that we can accomapny her in her hair removal journey. Watermelon enjoys our beauty herbal tea exclusively available at The Café in the flagship store at The ONE besides her sessions. She also loves our PRO-U EPID-COOLING SYSTEM, which spares her from the freezing sensation that normal hair removal methods would give. Rain is our Premium client since MediLASE has established. We are so grateful that we can help her with her hair concerns. And we got such a great sense of fulfillment! Joman comes for her treatment again! It is a big credit to our technology and service for her to entrust us with her most private body parts. Registered customers are entitled for a free PRO-U® ANALYZER test. This offer is only applicable for first time customer of MediLASE and HEALTHOLOGY BIOSCIENCES GROUP. Only applicable to customers aged 18 or above. Customers must present HK/China/Macau Identity Card to enjoy the offer. Customers must register and make appointment prior to treatment. This offer cannot be exchanged for cash or enjoy with other promotions. Limited space only. MediLASE reserves the right to modify or replace these Terms and Conditions without any notice. Undergoes PRO-U® ANALYZER (PUA), a 30-minute skin assessment covering 4 scientific steps, prior to your laser hair removal treatment to ensure safety, effectiveness and efficiency. I have read and agree to the privacy policies andterms and conditions. I wish to continue receiving HEALTHOLOGY BIOSCIENCES members-only and MediLASE product-related and promotional information. I understand by unsubscribing to marketing newsletters, I will also no longer receive gifts, discounts and promotional offers. 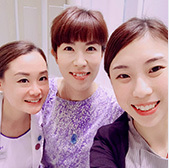 Positive comments are about the personal experience of our customers, the actual treatment result depends on various factors. *The 300,000+ positive reviews come from: Treatment satisfaction of MediLASE customers accumulating Facebook Likes, online positive comments, post-treatment CSAT rate, handwritten cards, together with positive reviews from beauty experts, celebrities, KOLs and beauty editors, dating from 2013 to July 2018. "^1. Ref. : Laser for Hair Removal in Raleigh: Selecting the Best Laser for your skin type, Michael Law, MD, Raleigh-Durham Plastic Surgeon；Ref. : Illumination Geometry: The Importance of Laser Beam Spatial Characteristics, KURT G. KLAVUHN, PHD, Research Scientist, Pleasanton, California. 2. 醫學證實755nm波長的激光最易被毛髮黑色素吸收，為目前最有效的脫毛激光，更快徹底解決毛髮問題 Ref,: Laser for Hair Removal in Raleigh: Selecting the Best Laser for your skin type, Michael Law, MD, Raleigh-Durham Plastic Surgeon；pulse width 為激光能量發出的時間，pulse width越短，激光能量越高，更有效更快更徹底解決毛髮問題。3. MediLASE PRO-U® 24mm 的激光脫毛科技，相比其他光學技術，其能量更集中地深入毛囊深處，更有效根除黑色毛髮，達致理想脫毛效果。每次療程可根除20%含黑色素毛髮，1年內接受約4-6次療程，可杜絕毛髮再生。A Report on the ""Safe and Effective Device For Permanent Hair Reduction"" from FDA Certified 510(K) Summary. *完成整個療程後，黑色顯眼毛髮會得以去除，效果因人而異，若身體荷爾蒙分泌失衡或正值更年期，少量極幼細及淡色毛髮或會再生。4. 治療頭越大，激光能量越高 Ref,: Illumination Geometry: The Importance of Laser Beam Spatial Characteristics, KURT G. KLAVUHN, PHD, Research Scientist, Pleasanton, California. 5. MediLASE PRO-U® 24mm 10Hz發射頻率比上一代的GentleLase Pro LE（2Hz）快5倍。6. PRO-U® EPID-COOLING System is trademarked. 7. 醫學証實：755nm比810nm波長的激光更易被毛髮黑色素吸收，為目前最有效的脫毛激光，更快更徹底解決毛髮問題 Ref,: Laser for Hair Removal in Raleigh: Selecting the Best Laser for your skin type, Michael Law, MD, Raleigh-Durham Plastic Surgeon. 治療頭越大，激光能量越高 Ref,: Illumination Geometry: The Importance of Laser Beam Spatial Characteristics, KURT G. KLAVUHN, PHD, Research Scientist, Pleasanton, California. TKS 755nm激光採用15mm放射治療頭，PRO-U® 24mm激光採用24mm放射治療頭.